Palm trees, pink sand beaches, dreamy sunsets, life can’t get much better on the island paradise of Bermuda. Many people are known to have gotten lost in the mysterious Bermuda Triangle, but the answer to the conspiracy is simple: once they saw the island of Bermuda, they never wanted to leave! Bermuda is definitely not known as a budget destination, and getting around the island can be quite the hassle. This is why we put together the best places to stay in Bermuda, for all types of travelers! Compiled by our experienced team of writers, we found the best hotels ranging from the extremely luxurious to the most local to better help you decide where to stay on this island paradise. It doesn’t matter if you want to be unwinding at the spa or hiking the length of the island. This list puts together the best of what Bermuda has to offer. From hidden gems to popular beaches, by the end of this article, YOU will be the expert of where to stay in Bermuda! These are our best picks for where to stay in Bermuda. Looking for a specific place to stay? These are our highest recommendations for places to stay in Bermuda. For Bermuda, it can’t get any cheaper than this! Located in scenic Sunnyside, Pigeon View Cottages offers guests comfortable studio apartments, complete with air conditioning, WiFi, and a balcony for a reasonable price. The cottages at Pigeon View are also nearby the famous Rail Trail, a gorgeous hike which takes tourists down the length of the island! Just outside of downtown Hamilton, Blue Horizons Guest House puts you right on the beach while still being able to enjoy the public transportation of the city. All rooms at Blue Horizons have a balcony, free WiFi, as well as a TV. The guest house makes people feel right at home with warm hospitality and treating them as one of the family. Secure your own slice of heaven by booking into the Rosewood Bermuda. Known as the “Jewel of the Atlantic”, you will be given stellar views of the ocean from either your suite terrace or the white sand private beach below. After a dip in the sea, play a round of golf on the resort’s 18-hole course, and finally, treat yourself to dinner at one of the four restaurants this hotel offers behind its doors. Every evening at Rosewood is the end to a perfect day. The island of Bermuda is only about 22 miles in length, but despite its size, the country is home to some of the most striking landscapes in the world. Attracting many high-profile celebrities and politicians all make Bermuda their top choice of places to spend their holidays, therefore you can be sure to receive nothing but the best of service and amenities. With spectacular beaches spread out around the island, as well as many caves, hiking trails, and old forts, it can be hard to settle on one parish to stay in when visiting Bermuda. 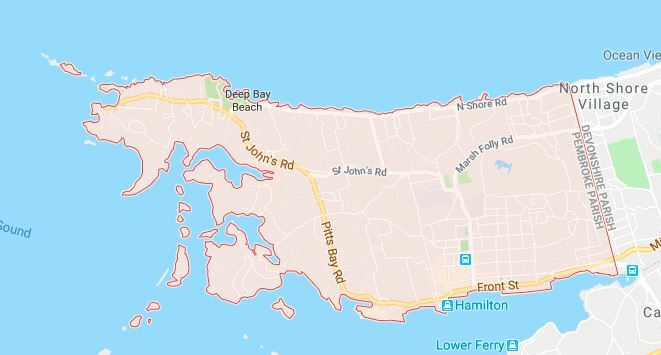 If you are wanting to see as much of the island as possible it is recommended to stay as close to the capital of Hamilton as possible. For those looking to stay at resorts, transportation will not matter as much. Pembroke and Hamilton are located in the center of Bermuda and also comprises the country’s downtown area. From here it is quite easy to visit all corners of the island by bus. Hamilton is also the center of the best nightlife and restaurants in Bermuda. Across the bay from Hamilton, Sandys has some of the most secluded beaches on the island, making it the ideal place for travelers who want to truly get away from it all. Spend a day at the spa or exploring the depths of the ocean. No matter what your pleasure is, Bermuda has a parish which is perfect for you! Now let’s take a look, in greater detail, at the best neighborhoods to stay in Bermuda. Each is a little different from the last so be sure to check out which is right for you! Centrally located, Paget puts tourists next to some of the most beautiful beaches and gardens on the whole island. This neighborhood also allows tourists the convenience of being able to get anywhere on the island hassle free. Time and time again Paget’s Elbow Beach is used to represent the whole island nation of Bermuda due to its mesmerizing pink sand and brilliant blue water. Elbow Beach is less crowded than other places around Bermuda and still has plenty of restaurants and shops nearby, making it the perfect place to play in the sun. What makes Paget perfect for first-time visitors in Bermuda is not only its proximity to some of the most gorgeous scenery on the island but how easy it is to reach the other ends of the country, needing little effort at all. Explore the gardens, lounge on the beach or go out and explore what other villages in Bermuda have to offer. No matter what, Paget is hands down the best place for first timers! Take in the sun on Elbow Beach’s pink sand beaches. Smell the roses at Bermuda’s Botanical Gardens, where you can find some of the most beautiful flowers and plants on the whole island. Explore the rocky Salt Kettle Bay which has served as an inspiration for countless artists. Chase ghosts and walk through history at St Pauls Church which was originally built in 1796. View local art at the Masterworks Museum of Bermuda Art. Venture into caves at Coral Beach, located on the South Shore of Paget. Grab a bite of local flavor at Twisted Sitsah’s Coffee Shop. Newstead Belmont Hills is in the running for being one of the best resorts on the whole island. The hotel not only has an 18-hole golf course, but also a full-service spa, fitness center, hot tubs, private pool, and breathtaking views of the harbor. Each room at the Newstead is tastefully decorated and has a flat-screen TV, WiFi, and even kitchen facilities. From your balcony at Fourways Inn, you will be overlooking a relaxing pool, French restaurants, and a private beach all at your disposal. Other than your balcony with a garden view of the resort. Fourways guests are treated with a marble bathroom, free WiFi, TV, and a spacious luxury room. Just minutes away from the ferry and the pristine beaches, Fourways Inn puts you as close as possible to a relaxing holiday. Be pampered and served with only the best Bermuda has to offer at Elbow Beach. This luxury resort puts you minutes away from lounging on pink sand beaches and miles of gorgeous coastline. The hotel itself has some of the best restaurants on the island, so you are sure to go back to exploring Bermuda with a full belly and a smile on your face. End each day from your balcony suite and unwind with your high definition TV, free WiFi, and minibar. Hamilton is the urban center of all of Bermuda as well as the island’s capital. It is no wonder this city would be one of the best places to base yourself out of to explore the rest of the island. While the hotels are all catering to luxury guests, the city itself remains very local. Therefore, many of the shops, restaurants, and cafes maintain a low price, making it the best place on the island for budget travelers. Hamilton is also centrally located with bus services running throughout the island. Basing yourself from the capital city is the best way to see all ends of the country, without having to rely on tours or other means. The city itself has a huge nightlife, as well as a colorful colonial district which will have tourists exploring the streets of Hamilton for days. Ride around town on a horse-drawn carriage and see a different side of Hamilton. Man the guns at the historic Fort Hamilton Battery. Touch the deepest reaches of the ocean at the Bermuda Underwater Exploration Institute. Sail the seven seas from the picturesque Hamilton Harbor. Stroll through one of the many parks such as Elizabeth or Victoria Park. Prey and find peace at the Bermuda Cathedral. Grab a bite at the Pickled Onion, with great balcony views of the harbor. Just a short walk away from downtown Hamilton, Edgehill Manor puts guests right on top of some of the most beautiful harbors on the island. Each of the luxurious rooms at Edgehill provides guest with a flat screen TV, fridge, WiFi, and toaster. With gorgeous sea views and upscale service, Edgehill Manor is sure to leave you with a memorable holiday. Down the road from the yacht club and Hamilton harbor, Royal Palms Hotel treats their guests like kings with spacious colorful rooms, coffee maker, WiFi, flat screen TV, and a small kitchen. Within the hotel’s doors, they provide guests with 2 restaurants, a pool, and even a lush garden to enjoy. Hamilton Princess and Beach Club is truly the best of two worlds. Guests can enjoy private beach access and relax in the infinity pool while still having the option of exploring downtown which hosts some of the best nightlife on the island. Pembroke is the parish which actually includes the capital city of Hamilton, and makes our list as being the top place of nightlife in all of Bermuda. Being the most densely populated area on the island, it goes without saying this district is the life of the party when it comes to bars and clubs. The live music is not only the best on the island, but the bars also boast a cuisine that will have you coming back night after night. Other than sending your taste buds to heaven and dancing till you drop, Pembroke has some of the most spectacular coastlines on the island. The colonial architecture and old-world charm further adorn these already breathtaking beaches. Pembroke has to facades to its nightlife. You can either have some wine, listen to smooth jazz as you watch the night sky or grab a glass and move to the beats. Either way, you will have a night to remember for years to come. Gaze across the water at the iconic Spanish Point. Grab a pint at the Docksider Pub. Boogie all night long at the Coconut Rock. Feel the sand between your toes at Clarence Cove. Get a taste of colonial Bermuda at the old Government House. Take a dip in the pristine blue water at Deep Bay Beach. Spoil yourself with dinner at 1609 and gaze over the sea at this shore side restaurant. Lemon and Ginger Apartments is located in the suburbs of Bermuda, only minutes away from downtown and the white sand beaches. The apartment consists of a bedroom, bathroom, living room, and fully equipped kitchen. With its outdoor patio in the heart of Bermuda, you can truly relax and live the local life at the centrally located Lemon and Ginger Apartment! This modest apartment complex has a garden, pool, as well as a balcony for each of their cozy apartments. Each room is provided with free WiFi, a TV, a fully equipped kitchen, and a view of the pool from the room. The hotel is only minutes away from hiking trails, the beach, and historic buildings such as the Admiralty House. At the Oxford House, you can pretend you are a local in this classical-style colonial townhouse, while still pampering yourself during your lavish vacation in Bermuda. In Bermuda, it is difficult to find a place that would check off the list for many people’s ideal “cool” destination. Many of the art museums cater more towards upper-class clients rather than young hipsters and starving artists. Sandys, also known as Somerset Village, still has some of the most luxurious resorts on the island but also offers plenty of history, ruins, graveyards, and local culture to attract a more offbeat crowd. Nearby the Royal Naval Dockyard you can find a 19th-century graveyard where many of the royal marines who died of yellow fever are laid to rest. The area also is home to several forts such as Fort Sacur and Gunpoint Fort. Much of the shops in the Royal Naval Dockyard are geared towards alluring cruise-goers with their kick knacks and tacky souvenirs. Despite the touristy side of the area, you can still find craft markets and record stores amongst the shops selling Bermuda keychains and other novelties. Shop at the Royal Naval Dockyard and explore British Naval History. Walk across Somerset Bridge, the world’s smallest drawbridge. Stroll along Mangrove Beach and view the nearby 18th-century post office and graveyard. Wander through Cathedral Rocks, a bizarre rock formation on the coast. Dine on the beach at Tamarisk Restaurant & Terrace. Browse through old records at Dub City Records. Look at local art ranging from paintings to sculptures Bermuda Art Center. Lose all the crowds at the secluded Hog Bay Beach. Offering a more local perspective to Bermuda, these apartments put you close to the true beauty of the island without all the distracting bells and whistles. The property includes a barbeque and patio overlooking the sea so guests can feel truly immersed in the lush surroundings. Each homey room at the Bermuda connections is provided with free WiFi and some even include a fully equipped kitchen. Willowbank Resort spoils its guests with an outdoor swimming pool, restaurant, gift shop, and a fitness center. Each of their luxurious rooms are complete with flat screen TVs, free WiFi, microwave, and bathroom with a bathtub. The nearby beach is perfect for swimming and snorkeling, thus making sure fun is never too far away. Welcome to paradise at the Cambridge Beaches Resort and Spa! This hotel goes above and beyond to make sure you have all you could possibly need to bring your fantasy vacation to life. This resort includes 3 fine dining restaurants, spa, pool, and tennis courts to ensure you have a magical time in Bermuda! Many of the hotels in Bermuda are geared more for honeymooners and older couples, some resorts even have adults only policies. On such a beautiful touristy island, is there no place that caters to families with children? Southampton is by the best place to bring families. With so much to do and the amount of convenience, you are sure to take some memorable photos that you will be looking back on for years. Some of the resorts in the areas have clubs and activities specifically for children. Many of the resorts also provide free shuttles, taking people to and from some of the top destinations on the island. Many of the popular beaches such as Horseshoe Bay, Church Bay, and Jobson’s Cove are just a stone throw away from the resorts. Thus, making getting from the hotel to playing on the beach a cinch. Southampton has some of the most gorgeous beaches in the whole world and is sure to constantly take your breath away! Take a dip into the ocean at Horseshoe Bay Beach, often called the most beautiful beach in the world! Snorkel and view some coral bursting to the seams with marine life at Church Bay. Grab your binoculars and whale watch on West Whale Bay Beach. Climb the oldest cast iron lighthouse in the world on Gibbs Hill! Get a great view of the coastline at St Annes Church and Whale Bay Fort. Dine on the beach at Coconuts Beach Bar & Restaurant. Walking into Wade’s Garden Inn is like being welcomed into your home away from home. These cozy apartments are sure to remind you of the quaint houses you grew up in. Each room at Wade’s has free WiFi, fully equipped kitchen, private bathroom, and a patio overlooking the garden. Staying at Wade’s Garden Inn is truly like staying with family. Other than its beachfront rooms and restaurants, The Reefs Resort also entices its guests with an infinity pool, spa, and tennis court. Every room has its own private patio or balcony, flat-screen TV, and free WiFi. With snorkeling and kayaking all on the property, you are sure to have days jam-packed full of fun at this resort! This state-of-the-art luxury resort has everything possible to pamper and spoil their guests such as an 18-hole golf course, spa, beach club, and over 9 restaurants to choose from. The hotel also provides a free shuttle to get guests to and from the capital of Hamilton. It doesn’t matter if you are sipping martinis at the poolside bar or soaking in the ocean, Fairmont Southampton is one of the best luxury experiences on the island! Bermuda is the definition of a tropical island paradise! With secluded coves to pink sand beaches, traveling to Bermuda is like stepping into a postcard. The island has hiking trails and kayaking to entertain the more energetic of travelers, and lazy beaches to satisfy the beach bums. Without a doubt, Bermuda is an island which will have you dreaming of coming back for the rest of your life! Out of all the neighborhoods and parishes, Pembroke is by far our favorite. Although it’s beaches are nowhere near as spectacular as some of the others Bermuda has to offer, it does put tourists in a travel hub which makes it easy to visit other towns around the island. If you are traveling to Bermuda you might as well go all out and splurge on the best hotel, therefore Rosewood Bermuda takes the cake for being the best hotel on the island. For the duration of your stay be treated like royalty and have the vacation of a lifetime. Have we missed anything? Let us know in the comments below. Have a safe and fun journey to Bermuda! Have you checked out Costa Rica? Here’s an ultimate guide to the hidden gems in Costa Rica, plus a neighborhood guide to where to stay in Costa Rica, plus the best hotels in Costa Rica– all written by our travel experts to save you time and money for your adventure!